The prevalence of race in American schools has been reexamined in recent years, as new reports indicate growing segregation more than six decades after Brown v. Board of Education. But a new study of millennials reveals surprisingly mixed views when it comes to equity and the need for racial integration. Respondents also voiced strong — if occasionally contradictory — opinions on charter schools, standardized testing, and school quality in the survey of 1,750 Americans ages 18–34. The study was conducted as part of the University of Chicago’s GenForward project to measure the political attitudes of America’s youngest voters. The issue of race divides young people of different ethnicities. About three-quarters of millennials across various ethnic backgrounds agree that low-income students get a worse education than those from wealthy families. 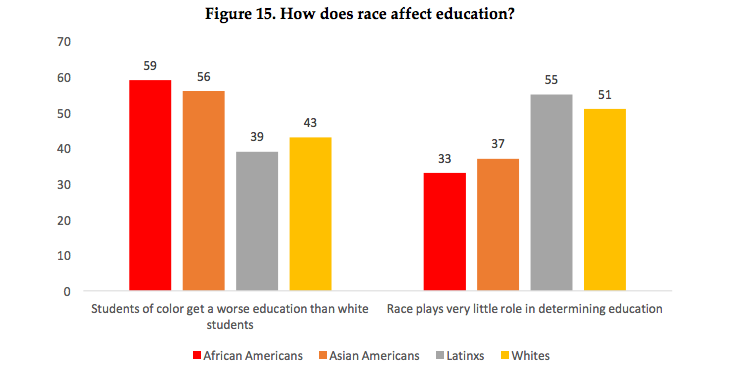 But there is less agreement about how race affects quality of education. Black (59 percent) and Asian (56 percent) millennials generally agree that students of color receive worse schooling than white students. 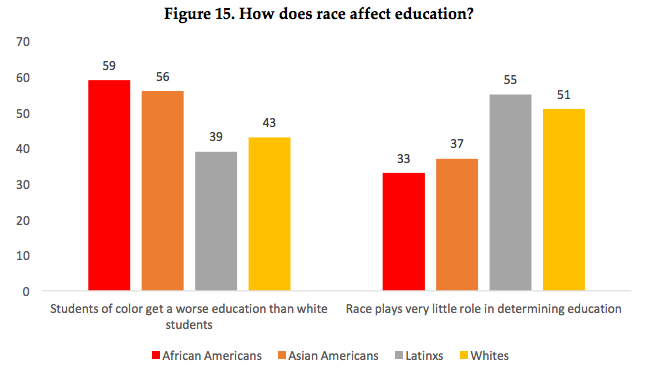 But majorities of Latinos (55 percent) and whites (51 percent) believe race plays “very little role” in educational quality. A slim majority of black (54 percent) and Asian (52 percent) respondents also believe that students should attend racially diverse schools even if none exist nearby. In contrast, the bulk of Latino (61 percent) and white (73 percent) respondents think students should enroll in their neighborhood schools, even if the result is less student diversity. 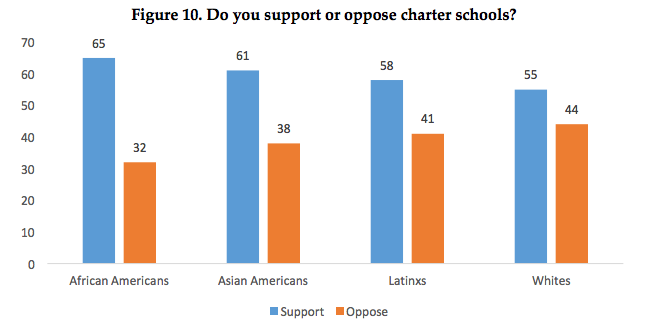 On school choice, education reformers will be relieved to learn of millennial enthusiasm for charter schools, especially given the weak reception they received in this year’s Education Next poll. In that study, public backing for the schools fell by 12 points over the preceding 12 months — the largest such decline for any issue that was surveyed. Taken together with Massachusetts voters’ resounding defeat of a 2016 charter expansion initiative, as well as President Trump’s unfettered support for taxpayer-funded vouchers, it suggested a further fracturing of the consensus around school choice. GenForward participants, many only recently removed from their high school or college years, mostly favored charters. Nearly two-thirds of black and Asian-American respondents voiced their approval, while Latino and white respondents did so by margins of 17 percent and 10 percent, respectively. Healthy majorities from all ethnic groups supported private school vouchers for low-income students; when the researchers polled universal vouchers, approval remained above 50 percent for all groups except whites (49 percent). Millennials more closely resemble their elders when it comes to a famous education paradox: Though they rate their own schools highly (54 percent assigned them either an A or a B), they take a dimmer view of America’s education system as a whole (76 percent grade the nation’s schools as a C or worse). The belief that one’s own school represents the oasis amid a nationwide desert of mediocrity, known to psychologists as the “mere-exposure effect,” has been observed in parents in other surveys. In each group, 69 percent or more of respondents say that there is too much testing in schools. Yet consistent majorities also disapproved of parents opting their children out of taking those tests. Public opinion on key education issues may be disparate across ethnic groups, but when asked to choose among ways to improve American schools, every demographic chose the same three steps: increasing teacher pay, increasing teacher training, and increasing school funding.